By 2035, 11.5 million Americans will be over the age of eighty-five, more than double today's 5 million, living longer than ever before. To enable all of us to age with dignity and security in the face of this coming Age Wave, our society must learn to value the care of our elders. 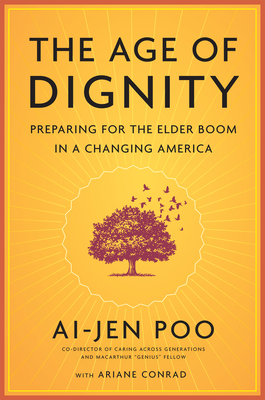 The process of building a culture that supports care is a key component to restoring the American dream, and, as Ai-Jen Poo convincingly argues, will generate millions of new jobs and breath new life into our national ideals of independence, justice, and dignity. This groundbreaking new book from the director of the National Domestic Workers Alliance offers bold solutions, such as long-term care insurance and cultural change to get all of us to value care, which is already at the heart of a movement transforming what it means to grow old in the United States. At the intersection of our aging population, the fraying safety net, and opportunities for women and immigrants in the workforce, The Age of Dignity maps an integrated set of solutions to address America's new demographic and economic realities. Ai-jen Poo is the director of the National Domestic Workers Alliance (NDWA) and a co-director of the Caring Across Generations Campaign. In 2000, she co-founded Domestic Workers United. She lives in New York City.